03/02/2010 - Luckily it wasn't a windy night in Nelson so the tent stayed put. We packed up the tent in record time and it was my turn to drive. 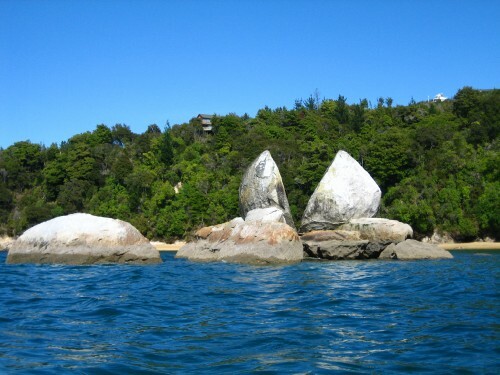 We had heard that Abel Tasman National Park was really nice and it was only an hour and a half west of Nelson so we headed there for the morning before going to Kaikoura. The weather was really nice and we took a little walk along the seafront before we left for kaikoura. As we had gone further west it was a 5 hour drive, I started off well but got a little tired so asked tom to take over. It was a very quiet drive, we hardly saw any towns along the way. Once we reached the east coast and started driving along the coast we saw seals on the rocks on the side of the road which was really cool as there were loads of them. We got to Kaikoura about 3 o'clock and found a campsite right by the sea that was pretty quiet so we put the tent up then went into town to see if we could go swimming with the dolphins as we had been told it was really good to do here. But when we asked at the information centre they told us it was all booked up until the weekend and we were only planning on staying here one or two nights max. So we had a little think and saw that the prices and thought if we really wanted to do we could either drive back up as its only a couple of hours from christchurch or do it in another place near christchurch called Akaroa. After that we went town to the peninsular where there is a seal colony and we saw a few of the big seals chilling out on the rocks. Tom went to lay down by one of them for a photo but it started growling at him so he quickly backed up. There were lots of people in the sea trying top swim with the seals but they are so fast in the water.